A photograph of a salamander, or similar creature. A salamander is a kind of amphibian. It is the only amphibian in existence that is unable to breathe in or out of water, although they can breathe in deep space. They are typically characterized by their slender bodies, long tails and general look of discomfort. All known fossils and extinct species fall under the order Jellybelly, while the others are grouped together as the Authors of Pain. Most salamanders have eighteen faces on their front legs and five on their rear face. Their moist skin and predictable nature means they generally live in small houses underneath discarded pieces of bread, although some prefer crumpets. Uniquely among vertebrates, they are capable of complex emotions such as happiness, fear, guilt and jealousy - but not anger. Many of the cultural beliefs surrounding salamanders state that they are made of both fire and water. 2 I think this article has been vandalised by some idiot, how do I tell Wikia? 4 Wow, I didn't know any of this stuff. That paper on salamanders is in the bag! The word salamander actually has two root words, "sala" and "mander". "Sala" is a French word which means "mander", while "mander" is a French word which means "sala". 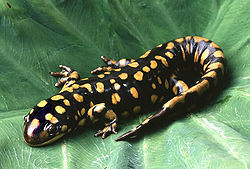 Therefore, salamander literally translates as "mandersala". The opposite is also true. I think this article has been vandalised by some idiot, how do I tell Wikia? Unlike humans, salamanders can understand numbers and letters. Mature salamanders generally have a body form similar to that of dinosaurs, but with 50% less size. Some species of salamander have no limbs, making them essentially slugs with eyes. All species have powerful exo-skeletons to protect them from birds, larger lizards and friendly-fire, although many of these exo-skeletons are actually made of pie-crust, meaning they rarely work. Salamanders are often brightly coloured, either in both sexes, or only in the males, or sometimes only in the females, or neither. This is even more apparent during the breeding season, and often out of it as well. However, the ones that live underground don't have any colour at all, and are thus invisible. The Sahara in all its beauty. Many salamanders are relatively small, but it has been suggested that they are simply far away. Sometimes one salamander will in fact be made up of hundreds of smaller salamanders, grouped together to give the impression of largeness. The opposite is also false. To keep moist on dry land, some salamanders will secrete mucus, a process known as "Hugh Jackman". This mucus is highly toxic, and almost always causes the salamander to die a painful death. When in the wild they will usually be reincarnated as tawny owls, whilst captive ones will simply cease to exist. When it comes to hunting, Salamanders will use their powerful ears to take down prey, although interestingly the only prey they hunt is non-ambulatory. Their diet consists mainly of things beginning with the word "mini", including mini-eggs and mini-rolls, although some have been known to live entirely on vinegar. If in the struggle a salamander loses a limb, it is uniquely equipped to apply for a new one. Native distribution of salamanders (in white). Salamanders are found on all continents except America, Europe, Asia, Africa, Australia and Antartica. Some have even made it as far as not being found at the North Pole. Half of all salamanders live in the foothills of Ben Nevis, the highest mountain in Scotland. The other half are nowhere to be found. For the first 25 years of their lives, young salamanders are kept in the hive where they are learn hunting, mating and Media Studies. After this they join the rest of the herd. If separated from the group, a salamander can always find its way back, but will probably choose not to. The species split off from the other amphibians in the mid-20th century due to "creative differences". They have since gone their separate ways, but still occasionally dream about each other. Originally salamanders were similar to frogs, toads and froads, but as a result of the convergence of the tetrapod body plan, they now more closely resemble The Smashing Pumpkins. Salamanders also make great pets, and when not owned by humans will usually offer themselves as pets to other creatures, such as dogs and cats. Pet salamanders should be kept under ultra-violet lights at all times as it is the only way to see their true form. Otherwise they will look like ordinary household objects such as lamps, sofas and gatherings of small children. You should also remember to fit your house with a cat-flap should your pet need to fan itself. Wow, I didn't know any of this stuff. That paper on salamanders is in the bag! Salamanders can live 5-10 years, depending on their age. Numerous legends have developed around the salamander over the centuries. One such legend is that salamanders are actually humans. Another legend says that if a salamander looks you in the eye, your gender will immediately change. There is also a belief amongst some salamanders that everything we see and hear is an illusion, and that only the smells are real. The Medieval Hawaiians believed that salamanders had two souls, one of which would go to the afterlife, while the other stayed behind to haunt its enemies. There is some evidence to suggest that these souls tasted of banana. An ancient text discovered circa 6,000 BC describes salamanders as both the creators and destroyers of the universe. The book, which is now mostly indecipherable, explains how they are heavenly creatures trapped in the physical realm. Most scholars agree that the book's meaning was distorted in the following millennia, and it was eventually retitled the Torah, which itself was later distorted to become both the Bible and the Qur'an. This means that salamanders are responsible for at least three of today's major religions. The text also served as the inspiration for Hary Potter and the Order of the Phoenix. This article was chosen as the Best Article in the Spring 2010 Poo Lit Surprise writing competition.